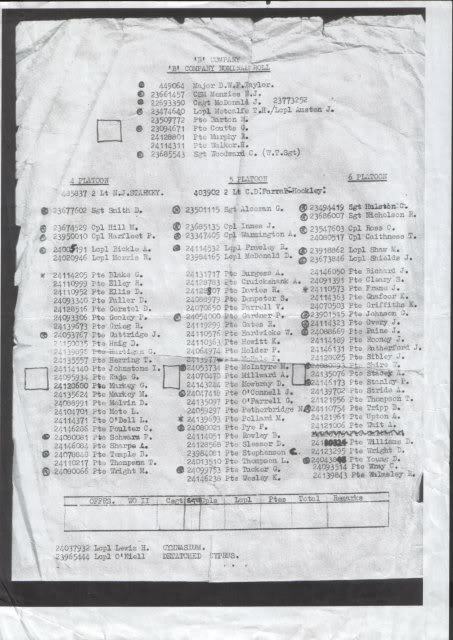 The Sgt Woodward on this nominal roll could that be the one known as "Bank Book" when he was in C Coy? It does not take much working out why does it? He was also known for his ability to fall asleep at the drop of a hat especially when on radio watch!! Aussie Nick may remember. Kentish Lad - Sgt Woodward is featured on 'B' Coy 3 Para NCO's - Malta Jan 1969 picture - 2nd in from the right seated next to Jimmy Innes, never heard of Bank Book ? As far as i can remember he was always called"Woody" i believe he later took over as WO2 Log Regt HQ 16 Para Brig at some stage,which made them not too happy Bunnies.!!! G'day all, I shot with Sgt Woodward in the 3 Para Shooting team for many years and he was always known as "Woody" He was the Army SMG Champion shot. His first name is Chris, I also know his middle name but if I say it I will have to kill myself. I have his phone number and address, however he is not on the net. Last time I saw him he was RSM 15th Scottish. Telford bloke. I dont think that is '68 list. I think that may even be Malta time. I am missing off 5 Pltn and Farrahs son was never Platoon Commander in 68 I don't think so anyway. We had Lt Soper and then Lt Whitford. Also missing is Mick Shaw and Mick Harfleet off 5 Pltn. Maybe they went to another Company in Malta or got promoted. The Nominal Roll is 68/69 we arrived in Malta late 68 (advance party with Nobby) and I left the Bn early 69 for UN Cyprus. I definately typed the original in Malta. on the grounds that anyone who made Sergeant or above would be institutionalised and utterly incapable of original thought? If you're reading this George, I hope you've forgiven me for lamping you with the tent peg mallet when you staggered back to the tent, pissed (again) and knocked my bed over (again) when we were at the Sharjah / Jebel Ali camp. That was the Christmas when expats in Awali invited (thru Bn HQ) "soldiers" to have Christmas lunch with them!....... "Support and "C" company's were immediately shipped out to Jebel Ali out of harms way. Happy days.....that was the time a pissed Seamus Flannagan (A/Tks) rocked up as Guard Commander wearing beret, boots, swimming trunks and pistol! Got away with it too and some other poor sod was detailled to be Guard Commander that night!